Look! They named a town after me! Can you get it built back up by my next trip? So you won’t be embarrassed by all the mess? 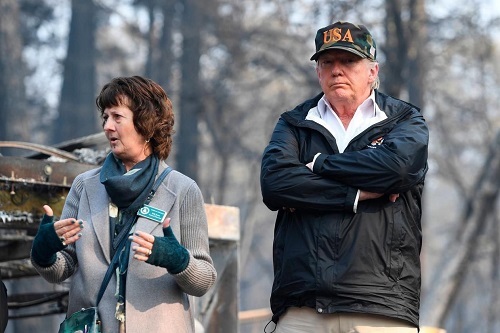 *Trump visited the town of Paradise California ground zero of the massive northern California wildfires that killed dozens and left thousands homeless. He got the name of the town wrong twice before being corrected by a member of the press. Dotty LeMieux has published three chapbooks: Let us not Blame Foolish Women, Tombouctou Press; The Land, Smithereens Press; and Five Angels, Five Trees Press. She published the literary journal, The Turkey Buzzard Review for several years in the late 1970’s, early 80’s. 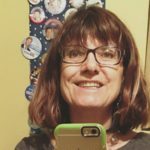 Currently, she lives in northern California with her husband and two dogs where she practices law and helps progressive candidates with their election to office. Dotty is proud to have been a Bernie Sanders delegate to the 2016 Democratic National Convention.